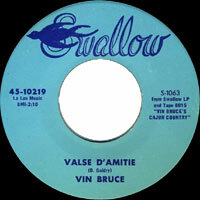 Chanteur Country US né Ervin Bruce, le 25 Avril 1932 à Cut Off (Louisiane). 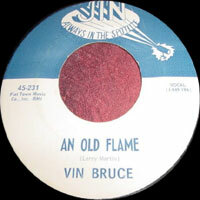 Born Ervin Bruce in Cut Off, LA, on April 25, 1932, Cajun singer Vin Bruce grew up in the musical environment provided by his father, whose fiddle playing for the local Cajun dances influenced Bruce to take up the guitar and write music. 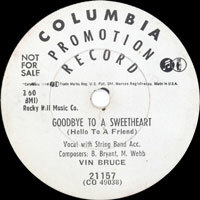 He honed his smooth and gentle Vocals style by playing with local groups, and by the age of 18, Bruce decided to take his career solo and caught the ears of Columbia Records. 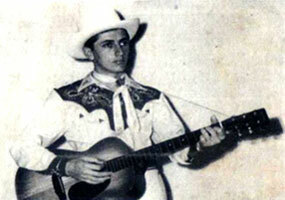 He recorded a number of 78s with Columbia between 1951-1956, scoring a hit with "Dans la Louisianne," which made him one of the first Cajun musicians to gain national attention, even landing him on the stage of the Grand Ole Opry, where he befriended Hank Williams, Chet Atkins, and others. 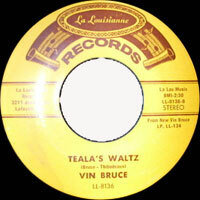 When the first wave of rock & roll devoured the industry, Bruce was dropped from Columbia, and while he maintained a much lower national profile, he was still lauded as among the best Cajun singers of all time by fans of the genre. Juggling a day job on an oil rig (he could no longer support himself on music alone) and a singing career, Bruce remained somewhat busy between the 1960s and the 1990s, releasing several albums and singles on various small labels. He continued to play regularly in and around Louisiana, and eventually he converted a barn into a recording studio and released the album Carousel for Two on the Louisiana Red record label in the fall of 2000. 1967 SP JIN 223 (US) Are You Forgettin' / ?